Is the Chicago Teachers Union run by a bunch of "rabble rousers"? Anyone reading the Chicago Tribune or some of the pundits of the plutocracy elsewhere in Chicago's media would hear that phrase often applied to the CTU — and to the CTU President, Karen Lewis. But the plutocratic press in the USA has found others to weigh in from the boss's point of view and against the work of the Chicago local of the American Federation of Teachers. In a classic kind of "Good Teacher/Bad Teacher" game that's been played as part of divide and conquer for too too long, some of those taking the boss's side and being praised in the boss's publication might surprise you. 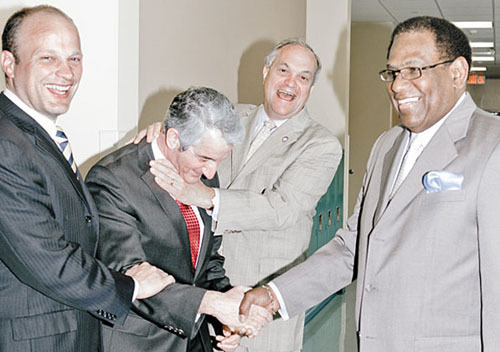 The man second from left in the above photograph, depicted as bowing before the mayor and school board chief of New Haven Connecticut, is David Cicarella, President of the New Haven Federation of Teachers, a local of the American Federation of Teachers. The above photograph, which had to have been approved by Cicarella, illustrated the May 9, 2013 article entitled "This Is How You Fix Public Schools" in Bloomberg Business Week. Not only does Cicarella seem to enjoy bowing down before the school board and mayor, but according to the article, he should be praised for not defending his members, 62 of whom have been fired recently for "underperformance." Readers are encouraged to comment here at Substance. Take this quote from a recent article in a national magazine: "Cicarella says he understands why so many union leaders play the part of rabble-rouser: It gets them elected..."
Well, OK. People say that about union leaders all the time, so? The "Cicarella" in that sentence, however, is the President of the New Haven Federation of Teachers. And that direct quote comes from the current issue of Bloomberg Business Week. That's the same publication that has spent the past decade (under its old owners, McGraw Hill; and under its current owner, Michael Bloomberg) pushing the attacks on public schools. In addition to promoting the thrust towards the massive profits to come from privatization of our "failing" urban schools, Business Week is praising some union leaders -- while attacking Chicago's. "The harmonious relationship between labor and management in New Haven is starkly different from many other large urban districts. Chicago teachers went on strike in September in part to protest Mayor Rahm Emanuel’s demand for evaluations. Karen Lewis, president of the Chicago Teachers Union, frequently ridicules Emanuel in public, once calling him a “liar and a bully,” and says teachers will work to throw him out of office when he’s up for reelection in 2015. New York City schools lost $450 million in state and federal aid after Mayor Michael Bloomberg (founder and majority owner of Bloomberg LP, which owns Bloomberg Businessweek) and the city’s United Federation of Teachers couldn’t agree on an evaluation process in time to meet a state deadline." In case anyone wondered what the American plutocracy thought about the Chicago Teachers Union and the current state of union and school "reform" in the USA, the May 9, 2013 edition of Bloomberg Business Week let its readers know. In a major article headlined "This Is How You Fix Public Schools," one of the five or six major media print voices of the ruling class praised the New Haven Federation of Teachers (an American Federation of Teachers local) and in the same article damned the Chicago Teachers Union (also an AFT local). The end of the school year is usually a happy time, but not for David Cicarella, president of the New Haven Federation of Teachers. He’s getting ready to have difficult conversations with some of his members, teachers who have flunked the Connecticut school district’s yearlong evaluation process. Cicarella will tell them the union won’t defend them, even if they have tenure. It’s time for them to look for another job. The harmonious relationship between labor and management in New Haven is starkly different from many other large urban districts. Chicago teachers went on strike in September in part to protest Mayor Rahm Emanuel’s demand for evaluations. Karen Lewis, president of the Chicago Teachers Union, frequently ridicules Emanuel in public, once calling him a “liar and a bully,” and says teachers will work to throw him out of office when he’s up for reelection in 2015. New York City schools lost $450 million in state and federal aid after Mayor Michael Bloomberg (founder and majority owner of Bloomberg LP, which owns Bloomberg Businessweek) and the city’s United Federation of Teachers couldn’t agree on an evaluation process in time to meet a state deadline. Everybody seems to lose in these standoffs, but the public increasingly blames unions for protecting bad teachers at kids’ expense. In 2011, 47 percent of the people who responded to a PDK/Gallup Poll said they thought teachers unions had hurt the quality of public education in the U.S., up from 38 percent in 1976. Michael Petrilli, executive vice president of the Thomas B. Fordham Institute, an education policy think tank, argues the unions themselves are responsible for their declining public support. “They’ve resisted every reform effort that’s come along,” he says. New Haven shows what can happen when management and labor are willing to bend a little. The catalyst for school reform in the city was John DeStefano Jr., a Democrat who’s been New Haven’s mayor since 1994. He controls the school board and has a close relationship with Mayo, who’s been superintendent since 1992. The district has challenges similar to those in other urban areas: In 2011, 78 percent of New Haven’s students were eligible for subsidized lunches, compared with 34 percent statewide. The 20,759-student district has historically fallen far short of state goals in math and reading. Starting around a decade ago, New Haven’s privately managed charter schools were shown to be vastly outperforming its public ones. At first, DeStefano was defensive. By 2008, though, he admitted the public schools were badly in need of help. “We were failing our kids,” he says. DeStefano recruited Garth Harries, a reformer who’d worked for former New York schools chancellor Joel Klein, to come up with a plan to overhaul New Haven’s schools. Harries recommended replacing the staff at failing schools and in some cases recruiting management companies from outside the district to run them. The plan also called for greater accountability for underperforming teachers. City leaders braced for a furious reaction from the union. “Let me assure you, we thought this would be a major world war,” Mayo says. DeStefano shrewdly courted Cicarella, asking for his advice about how to reform the schools. The union president was flattered. The mayor also reached out to Randi Weingarten, the influential president of the American Federation of Teachers. “She was very helpful,” DeStefano says. Weingarten’s blessing made it easier for Cicarella to sell the terms to his members. The union leaders spent much of 2010 negotiating details of the evaluation system with Mayo and Harries. Teachers who received an exemplary rating could be rewarded with lighter class loads and be invited to help develop the schools’ curriculums, Cicarella says. Those who scored poorly would receive coaching and other special services to help them improve. If that failed, they’d be let go. Cicarella had to persuade his members to go along. One thing that helped: Mayo agreed to a union demand that school principals be subject to similar evaluations. “There were some fractious meetings with teachers,” Cicarella says. “They would say, ‘What about the principals? Is it going to be the same for them?’ And I would say, ‘It will be.’ ” Cicarella sat on the committee that wrote the evaluations for principals, meaning union members have a say in judging their bosses’ performance. This is unusual, but perhaps it shouldn’t be. “Unions are easy to pick on,” says Andrew Rotherham, co-founder of Bellwether Education Partners, a consulting firm. “But school management is no picnic either.” Seven principals have left since 2011. The new system seems to be having a positive effect on student achievement. The district’s graduation rate rose from 58 percent in 2009 to 71 percent last year. Student test scores have improved, too. According to ConnCAN, which advocates for school reform in the state, the number of New Haven students whose scores have met or exceeded the goals on state tests has risen from 31 percent in 2009 to 54 percent last year. “For the past couple of years, New Haven has been among the districts that have made greater gains in the state,” says ConnCAN President Jennifer Alexander. Cicarella says he understands why so many union leaders play the part of rabble-rouser: It gets them elected. Yet his own experience shows that people in his position don’t have to pick fights to prove their loyalty to the rank and file. Despite Cicarella’s willingness to stand by as some of his members are shown the door, teachers reelected him to a third term in December. It wasn’t even a close race: He ran unopposed. The bottom line: Since teachers in New Haven agreed to abide by performance evaluations, 62 have lost their jobs. Their union hasn’t appealed or sued. Leonard is a staff writer for Bloomberg Businessweek in New York. If you want to know the source of company union ideologues in the AFT and NEA take a look at the website of the Teacher Union Reform Network (TURN). This AFT organization, founded in 1998, and later heavily funded by the Gates Foundation and the Broad Foundation, exists for the purpose of fostering management / union collaboration. I recommend reading this article http://www.newhavenindependent.org/index.php/archives/entry/school_terminations_loom/www.PKN-NewHaven.Org#cmt and the comments on the evaluation system posted by New Haven teachers back in 2011.